Doctors have less and less time to educate students. AbcdeSIM is a serious game developed by IJsfontein, a bureau for interactive media. The game teaches students to apply the ABCDE method for first aid without a doctor having to be present. 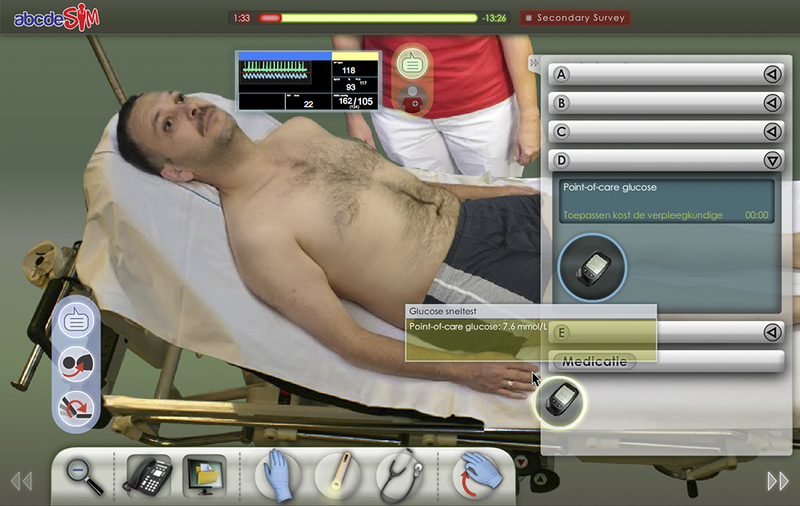 Players have 15 minutes to stabilize a virtual patient. They don’t know what the problem is, just like in real life. To find out what kind of complications there are and which patients need their attention first, the players have to apply the ABCDESIM method properly. The game has been developed in close collaboration with medical consultants of Erasmus MC. To simulate the interaction between all processes well, a true-to-life cardiovascular, respiratory and medication model was built into the game. Players can use all the equipment that is also present at a real first-aid post.